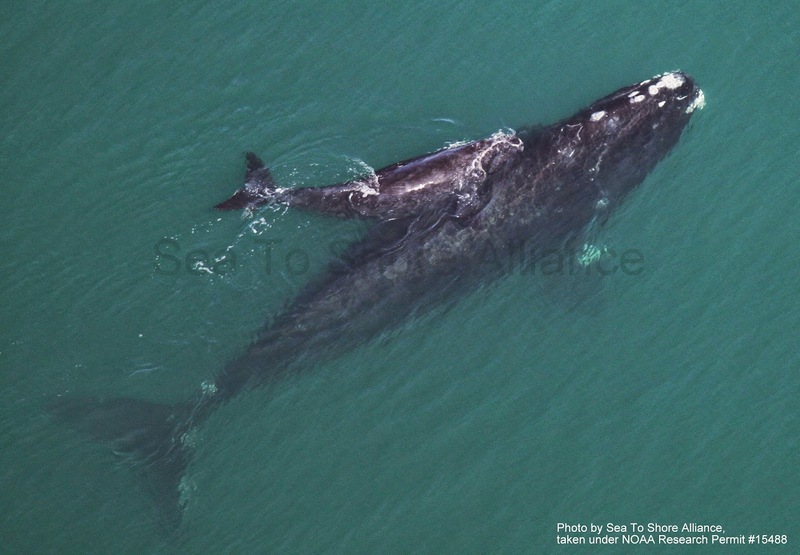 The right whale calving season, which roughly spans December through March, is winding down. But nobody told the right whales that! In the last couple of weeks, two new moms were spotted with their young calves, bringing the current total up to 17 calves. Given the recent spate of new calves discovered, I am cautiously optimistic that there will be a few more to come. Mantis and her calf. Photo by Sea To Shore Alliance, taken under NOAA Research Permit #15488. The mothers this year are a mix of first time mothers and experienced mothers and grandmothers. There are four first time cows- the youngest is nine years old. Some of the older mothers include Mantis (Catalog #1620), Clover (#1611), and Aphrodite (#1701). These three are all 28+ years old and have had 13 calves previously among them! Clover and her calf. Florida Fish and Wildlife Conservation Commission, taken under NOAA Research Permit #15488. Calvin (#2223), a 23 year-old with such an interesting story that she's a favorite in our sponsorship program, gave birth to her 3rd calf! Her previous two calves were both first seen off North Carolina, so I wonder if this year’s calf may also have been born further north but was just undetected there this year. She and her calf weren't seen on the calving ground this year until February 22nd. One of the moms has an interesting lineage. Smoke (#2605) gave birth to her third calf this year. A life size model of her mother, Phoenix (#1705), who is also in our sponsorship program, is hanging in the Smithsonian’s Sant Ocean Hall- the centerpiece of an excellent educational exhibit. Catalog #2790 and calf. Photo by Sea To Shore Alliance, taken under NOAA Research Permit #15488. Lastly, the identity of one of the moms is still tentative because we only have distant images taken by an observer on a dredge back in the beginning of February! 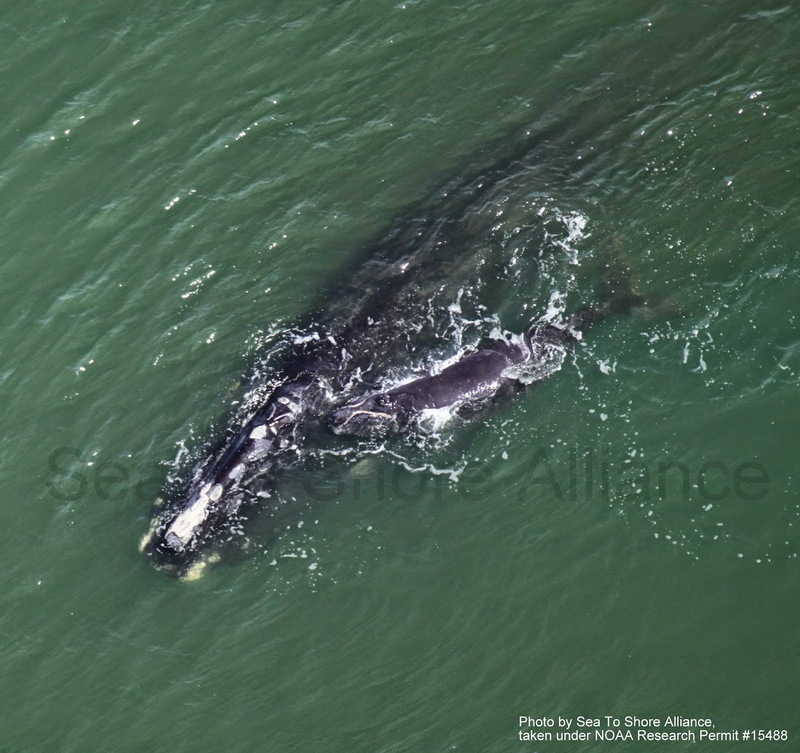 With so much survey effort in the area, we had expected her and her calf to have been seen again by now. The fact that the survey teams down there have not seen her serves as a reminder of what a large area the calving ground encompasses and how, even with regular, dedicated effort, it is likely that not all animals are sighted. Wolf and calf. Photo by Sea To Shore Alliance, taken under NOAA Research Permit #15488. Keep your fingers crossed for a few more calves! Last year there were 11 born, but we have had as many as 39 born in a year- so there’s precedence to hope for more! These glorious wonderful creatures of our oceans are so threatened by mankind! It saddens me terribly b/c I have a passion for whales and their place in our world as well as their survival!